Tweetbot for Mac, Tapbots’ Twitter client that I first reviewed in October 2012, has been updated today to version 1.2, which is available on the Mac App Store. Among the notable features of this new version, Tapbots is introducing notifications for specific users, support for inline Flickr and Vine previews, and compliance with the Twitter 1.1 API. Announced last year, the new Twitter API will force Tweetbot users to upgrade to Tweetbot 1.2 or later by March 5, 2013. After that date, all previous versions of Tweetbot will stop working. For the end user, updating Tweetbot for the new API means Tapbots had to alter some graphical elements of the app: among various changes, your own tweets will no longer be shown with an avatar on the right side of the timeline; profiles can now be opened on Twitter.com; and, you can click on the timestamp in a tweet’s detail view to open that tweet directly in the browser with a single click. I have to say, in using Tweetbot 1.2 for the past few weeks I have come to like the easier opening of profiles and tweets on the Twitter website, but I’m still getting used to seeing my tweets with my profile picture on the left side. I haven’t noticed other changes that have impacted my usability of the app. A great addition in Tweetbot 1.2 is the possibility to receive notifications when a specific user tweets. To do so, you can control-click on a user you’re following and choose Enable/Disable Notifications to receive alerts for new tweets. My wish is that this feature will someday come in the form of push notifications to the iPhone and iPad: it would be particularly handy for my workflow to keep the app closed and yet receive notifications for specific users that I care about. There are several changes and fixes that, while subtle, can fix those annoyances that add up over time. Double-clicking the Profile tab now respects the setting for background links in the browser; thumbnail support for Vine and Flickr is consistent with the latest update to the iOS app; you can now add .mp4 files to tweets, GIF uploading has been fixed, and images or video files can be dragged onto the app icon to compose a new tweet; “finally”, accounts can be reordered in the Preferences. 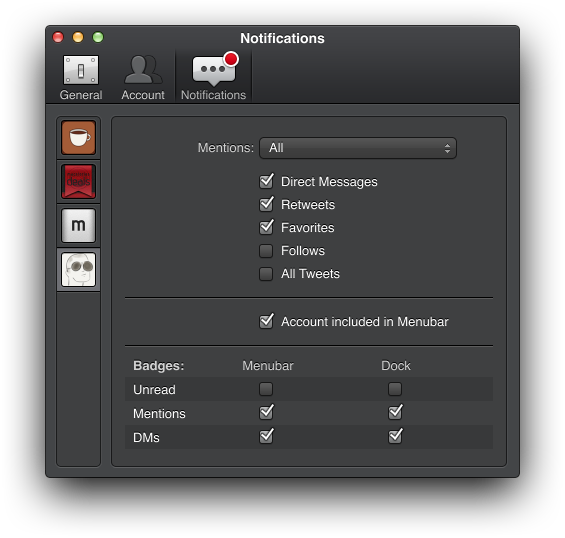 As shown in the screenshot above, the Notifications panel in the Settings now comes with more control over the notifications you want to show in Tweetbot's dock icon and menubar item. It’s good to see that Twitter’s API requirements haven’t been a detriment to Tweetbot’s efficiency so far. 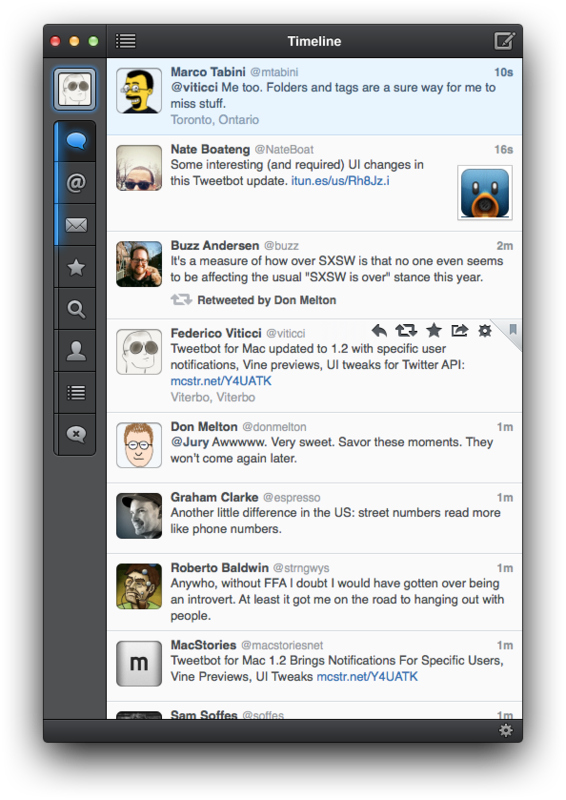 Tweetbot 1.2 is available on the Mac App Store.